March 18, 2019 at 1:39 pm PDT May contain affiliate links. Read disclosure. 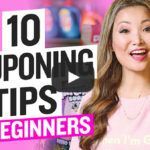 (Week 3/17) Here is a quick roundup of all the store Freebies for this week at Target, Walgreens, CVS, Rite Aid, and Walmart, after sales, coupons and rewards, including other free deals! FREE Eyeshadow Palette from Coastal Scents (Reg $20) – No Purchase Necessary! FREE Ice Cream Cone at Ben & Jerry’s on April 9th Only! Click here to see all Walmart Deals for this week.